A funny thing about teaching is how we revisit things. Sometimes, it’s because we teach the same texts or units of studies, the same courses. We revisit things because we need to refresh or remix them. This week, I pulled out my collection of teaching notebooks. I was looking for a sheet I knew I had tucked into one of them, one day, long, long ago. That sheet was going to be the bones upon which my awesome team and I built a new unit for our Grade 9s. I didn’t find it, and we’re just going to build off of something else instead. I did, however, come across this week’s mentor text, which was actually the first thing I really used as a mentor text in the manner we talk about here. We read it as a class, we discussed it, and used it as inspiration for a piece of writing. I had a fist pump moment, because in a pretty tumultuous week, I had figured out a really good mentor text to share with folks. This is a good piece that I’ve seen shared a number of places, so I wanted to do due diligence, and make sure that it hadn’t been shared by the Moving Writers team. And I discovered that it had been. But let’s revisit it. When I wrote about it last year, I paired it with a piece from Neil Gaiman, as both books talked about a love of literature. Let’s revisit it on its own though. I stand by my earlier assertion that this is a vital mentor text to use when asking students to talk about their reading lives. I had actually just kicked myself, as I have Grade 9 students that I’m just getting to know, and I didn’t use this piece. In revisiting it, I remember being so impressed with my students the first time I used it as a mentor text, the way that they analyzed it, pointing out features that I didn’t notice, highlighting how impactful Alexie’s moves were. That reflection makes it worth revisiting this week. Reflective Writing – I’ll be honest, I called this writing memoir last time. It still holds true, though, that this is a great mentor text for having students write about something in their educational experience, such as reading. It demonstrates how to focus on a single aspect, and bring in how various elements impacted that thing they’re focusing on. Alexie talks about how comics influenced his reading, how his father influenced his reading, how he carved out time to read, and how he feels about the importance of reading as an adult. A Deliberate Shift – Years ago, when I first used this piece as a mentor text, I was teaching Ben. I adored Ben, a young man with the confidence to simply be exactly who he was. He was also a great reader and thinker. It was he, not me, that noticed in the fifth paragraph, Alexie shifts to third person from first person. I was co-teaching at the time, and my co-teacher Rachel and I just stared at each other, completely gobsmacked that we hadn’t noticed this. The impact of this deliberate shift on Alexie’s part, once you see it, is epic. SInce then, that paragraph stands out, because in doing this, he changes the message of the piece. It is no longer about a young boy learning to read, but it now about the cultural stereotypes about education where a young aboriginal man is concerned. Alexie’s shift forces us to step out of his story, effectively “othering” that boy he had been writing about, or more appropriately, writing as. Often, our writers are looking for ways to include messages like this in their writing. They are looking for ways to make us think about injustice, or their ideas and opinions. And they sometimes do that so bluntly and overtly that it hurts the overall impact of their pieces. Showing them this shift, almost a jarring interjection, might give them a model to explore and emulate to make this happen more naturally in their work. Making Connections – The beauty of revisiting a piece is that time has passed, and you’re in a different place. As I write this, it’s 6 years later than that first use of this piece in a classroom. I do some things differently, and I focus on different things. Both of my Grade 11 and 12 courses are taught with a strong infusion of social justice material. We write about this often. And that might influence what we’d look at in this piece in those classes. Initially, we focused on this as Alexie’s story, and the fact that he was an aboriginal man was part of his identity as a reader, but not the focus of what we were looking at. Reading this piece, in 2017, his culture, the stereotypes and what they mean is all I can see in this piece. The intersection of his story as a reader, and the reality of life and education for First Nations students is important. I want my writers to look at a piece like this, to see how memoir is a vehicle for talking about social justice issues. I want them to see that our personal stories are connected to a larger network of story. Their stories connect to the story of their culture. Their stories connect to the story of our country. Their stories connect to the story of our society. This piece does this so well, that shift being one of the devices Alexie uses to change the focus. 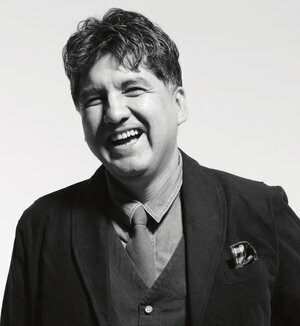 What’s also resonant in this piece is the way that Alexie talks about his place in the world, especially where it concerns First Nations youth. There is an assumption of responsibility, alongside a questioning of the way things are. In dealing with social justice issues, and critical thinking, this is where I want students to be, asking important questions, and expressing where they see themselves fitting in things. Alexie, a master of the craft, shows them how this can be done in a way that feels personal and true. I’m really glad I came across this piece this week. I’m also happy that I decided to push ahead and write about it again. Not only did it allow me to expand upon ideas that I already shared about this mentor text, but it gave me an opportunity to share new ideas that it inspired. It’s also a nice reminder for us about the importance of digging into the archives every once in awhile, and looking at old favorites with fresh eyes. Have you revisited anything lately? What have your “2017 eyes” seen that was new? Are there any things that you want to revisit?